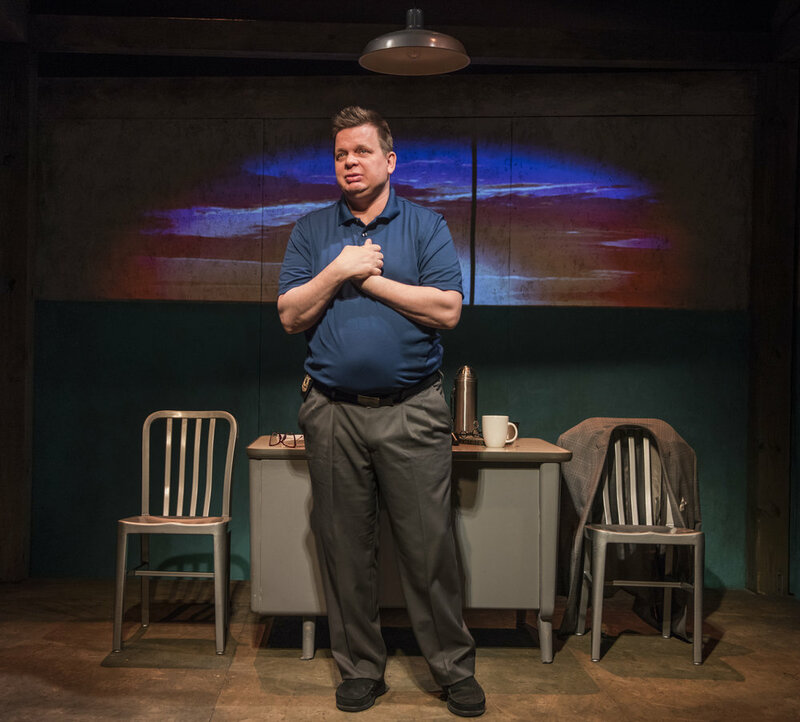 The Absolute Brightness of Leonard Pelkey written by James Lecesne and directed by Kurt Johns. 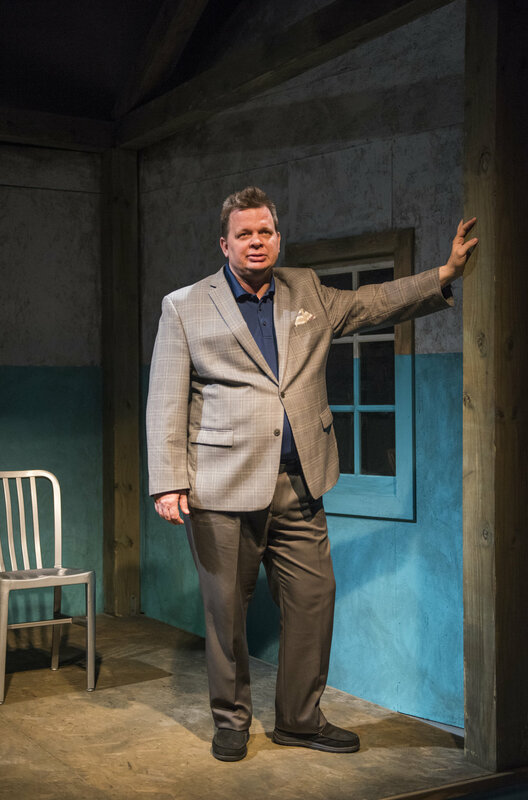 The solo performance portrays a colorful array of characters in a small Jersey Shore town all contributing to the unraveling mystery of Leonard Pelkey, a tenaciously optimistic and flamboyant fourteen-year-old boy who goes missing. The story revolves around his disappearance and the unexpected magical impact this young boy has had on an entire community. Solo performance by Ensemble member of American Blues Theater Joe Foust gives a wonderful performance. From victim to ferocious anger to nosey neighbor, the character growth and development across each personality is a leap. Foust hones in on the core emotions each character possesses and conveys them each so differently. The multiple distinctions were clear and concise, as well as delivered at a digestible and impactful pace. Foust has credits spread across Chicago land and a large spanned career, he also has appeared in American Blues Theater’s performance of Side Man and choreographed many fights for the company. Foust channels his inner Jersey accent across a variety of individuals and has such a capability to encapsulate anger, sadness, fear, and nonchalance making this performance comedic, dark and uplifting all at once. What a journey! The playwright James Lecesne wrote the short film Trevor, which won the 1995 Academy Award for Best Live Action Short and inspired the founding the Trevor Project, the only nationwide 24-hour suicide prevention and crisis intervention line for LGBTQ. The Absolute Brightness.. is one of a few solo shows he has written as well has holds an expansive career across stage, TV and film. Right off the bat, the title reminds me so much of a play on words of Milan Kundera’s existential work “The Unbearable Lightness of Being” in which it challenges Nietzsche’s concept of eternal recurrence and focuses on the idea that each person has only one life to live and that which occurs in life occurs only once and never again. Within a skeletal intimate space, a room with a single desk and two chairs with an abundance of props sets the scene. The audience travels all over the town with our main narrator who is the lead detective in Leonard’s case. Grant Sabin’s scenic design hallows out corners and sections of stage to illustrate the different areas around town from the lake bed to the clock sop to the morgue. Jared Gooding’s lighting design furthered these situational places with corner of light well placed. Honing in on spots at particular moments within the work was key in creating that deeper connection the narrative strives for. Mary O’Dowd’s properties design really highlights not only key details for each character played by Foust, but also illustrates what kind of person Leonard Pelkey was. You can tell a lot about a person by their personal items, and our missing lead definitely was illustrated effectively by all the evidence in his case including some very impressive rainbow sneakers. Solo performances are always a hit or miss for me. This one was definitely a hit and I believe it was not only the great acting, but the contribution of lighting and G. “Max” Maxin IV’s projection design. Information projected on to the set with quotes and images really adds context and attachment to the performance. Visuals always help draw in the audience and even the abstract concepts become more concrete. One particular moment that struck me was in the clock shop, all the clocks projected onto the wall were set to the “10:08 rule” – if you are unfamiliar is a rule among advertisers to literally have the clock smiling instead of frowning is more appealing for sales and this happens because of the phenomenon pareidolia, which is the tendency for people to see significance in insignificant things, for example spotting faces in random stimulus. A subtle choice maybe meaningless since the scene is in a clock shop, but a double meaning for the overall play’s message perhaps as well? I’d like to think so. It is very well written and holds a lot of truths about trying to teach kids to “emote rather than emojing”, how clouded our perspectives can be as a society and to encourage those that make us uncomfortable and scared because they shine so brightly. Ending on a note harkening back to the famous opening song to Rent, our lead detective concludes there is no way to measure a person. This production sheds light on an ongoing epidemic in our country with bullying, unhappiness and technology. The dangerous trifecta is explored, yet sparks hope in audiences and will have you leaving the theater more reflective than ever. An important piece of work and deserves as many people to be exposed to the absolute brightness of a young brave boy unafraid to be nothing but himself. The Absolute Brightness of Leonard Pelkey plays at Stage 773 (1225 W Belmont Ave) from now until April 27th. For tickets please visit AmericanBluesTheater.com or call the Box Office at 773-654-3101.